No shortage of fun to be had aboard this trail taming machine (click to enlarge). 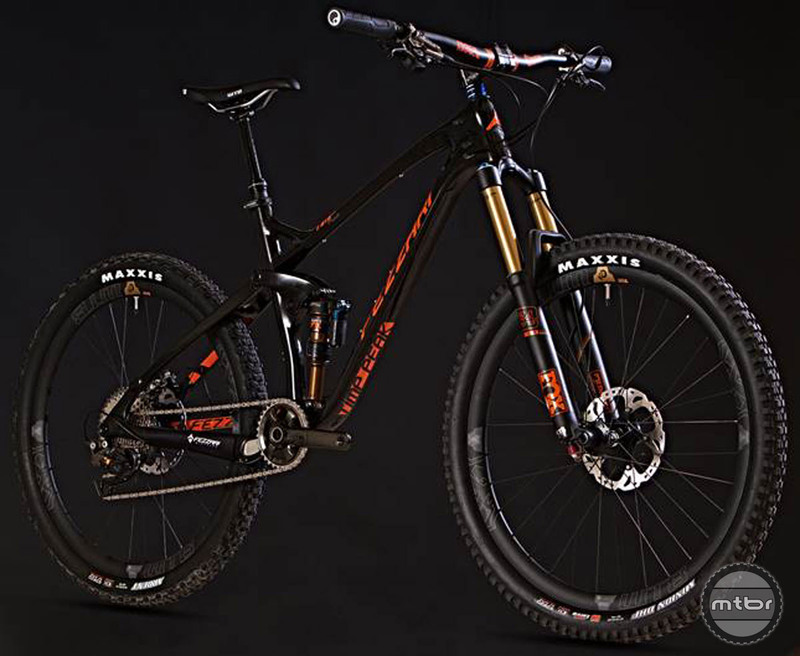 The dream mountain bike of the moment looks something like this: 140mm-150mm of top-shelf travel, carbon frame, carbon wheels, carbon cockpit, dropper post, and a high-end 1x drivetrain. For price, figure $7000-$8000. Or at least that’s common perception. But that budget busting perception may be changing thanks to brands such as Fezzari. 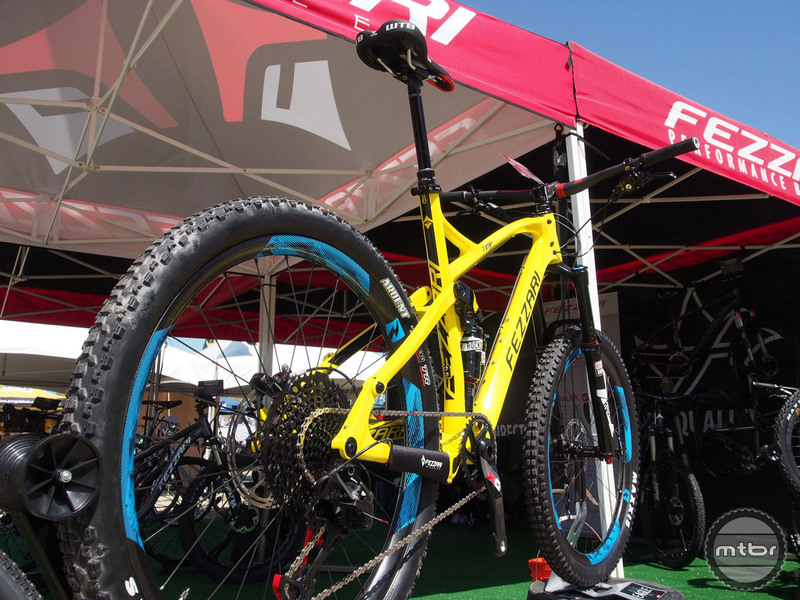 The Utah-based direct-to-consumer seller recently unveiled the latest rendition of its 27.5 Timp Peak carbon trail bike, which features updated frame geometry, a lower 13.5” bottom bracket, and a revised rocker link design that’s claimed to eliminate the pivot service interval required by its predecessor. 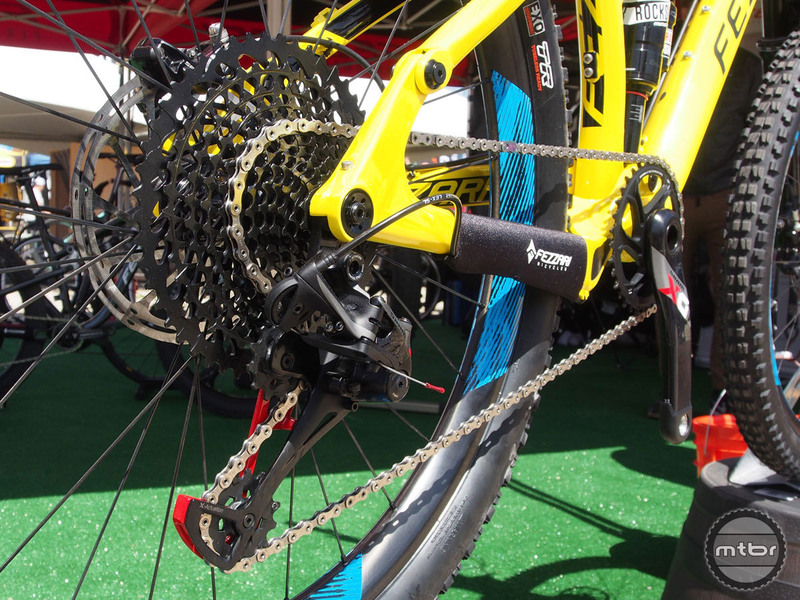 SRAM’s new ultra wide-range Eagle drivetrain is optional spec on this well-appointed 27.5 trail bike (click to enlarge). Spec on the halo 2.0 Timp Peak model includes Fox Float 34/Float X or Pike RCT3/Monarch Plus RC3 Debonair suspension, RockShox Reverb Stealth dropper post, Reynolds 27.5 Enduro carbon wheels, SRAM Guide RSC brakes, RaceFace Six Carbon/Atlas cockpit, and SRAM’s new X01 Eagle drivetrain. 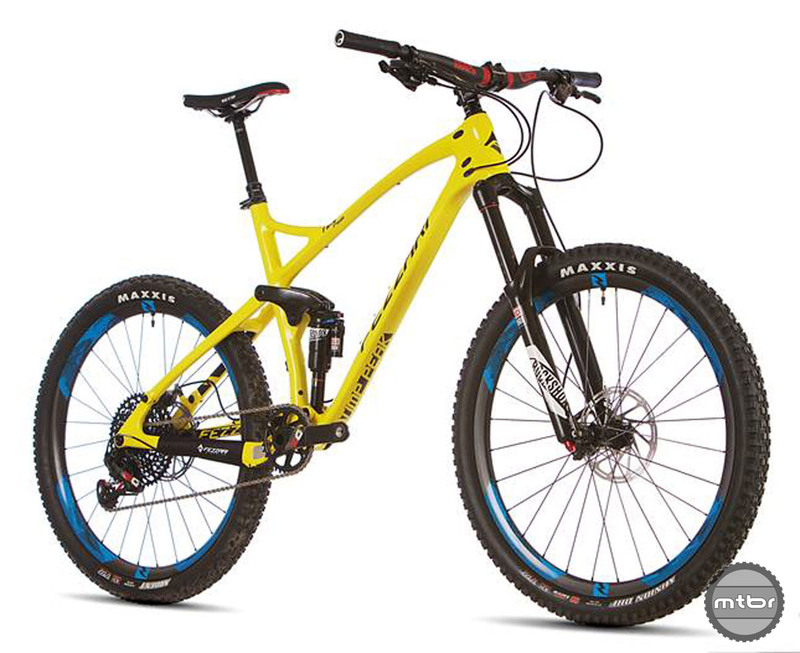 As for price, it’s just $5799, which seems like a screaming deal when you look around the rest of the MTB marketplace. The new Timp Peak also has optional external rear brake routing for those who prefer ease of maintenance over internal routing aesthetics. The frame comes in two color options: yellow/black and black/orange. And if that price point is still out of reach, the same frame and suspension choice, plus a SRAM X1 group, Guide RS brakes, and a WTB KOM wheelset starts at a more modest $3999. This Shimano XT build of the new Hidden Peak Carbon XC29 comes with Fox Factory 32 fork and shock, and Reynolds carbon wheels. Price is $4999 (click to enlarge). 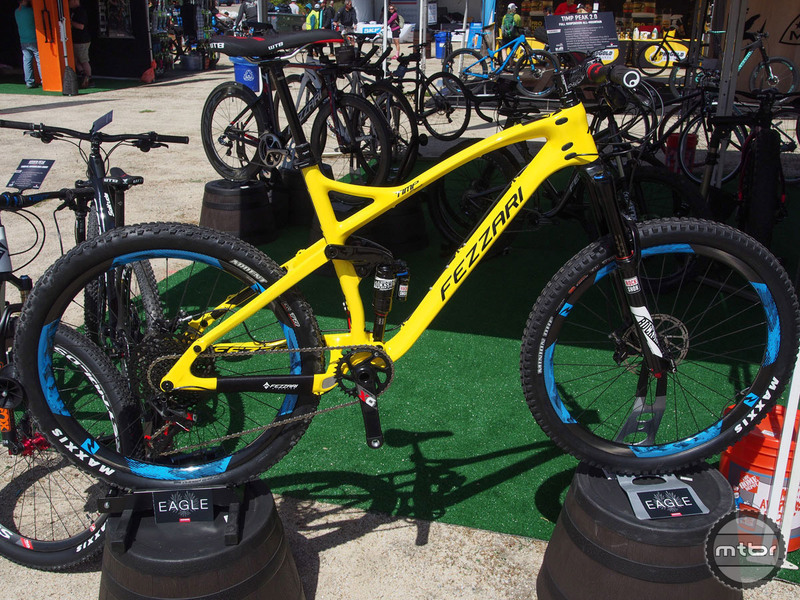 Fezzari has also retooled its Hidden Peak Carbon XC29, which is now built around a complete composite frame (front triangle, rear triangle, rocker link), and has 100mm of travel, a 70-degree headtube angle, 30mm BB drop, and 73.5-degree seat tube angle. Claimed frame weight size medium is a respectable 1950 grams. Complete builds start at $2899 with a RockShox Reba fork and RL/Monarch RL Hi-Volume shock, SRAM GX drivetrain, SRAM Level TL brakes, and WTB STP i23 wheels. 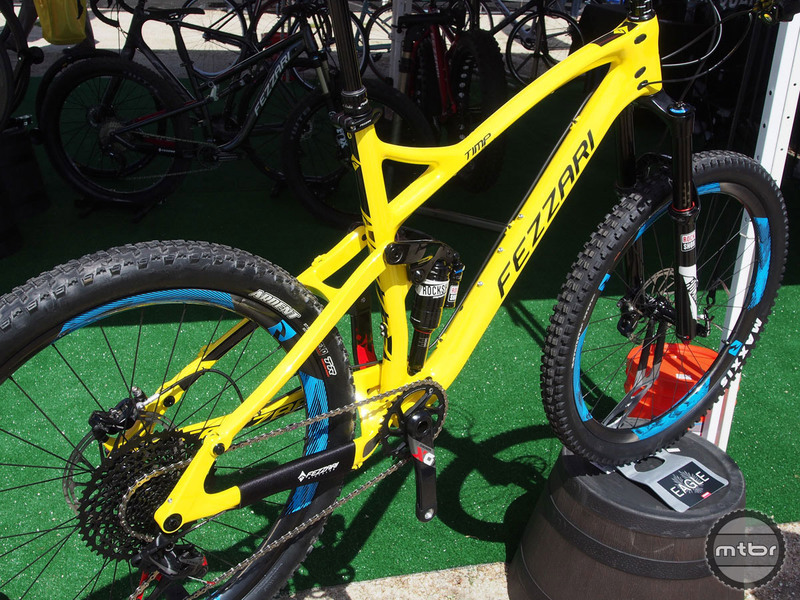 Fezzari’s latest drop bar bike is a disc-brake equipped adventure machine with clearance for up to 40mm tires (click to enlarge). Finally, if you’re looking to add a little drop-bar adventure to your riding life, Fezzari has launched its Shafer Gravel Road ($3199), which features an XR-6 carbon frame, flat mount disc brakes, 142×12 rear axle spacing, 40mm tire clearance, and integrated rack and fender mounts. The tall head tube (195mm on size 58cm frame) means greater comfort and control, which is further enhanced by stability-increasing 72.5mm BB drop and long’ish 440mm chainstays. Three water bottle mounts let you go deeper into the backcountry. 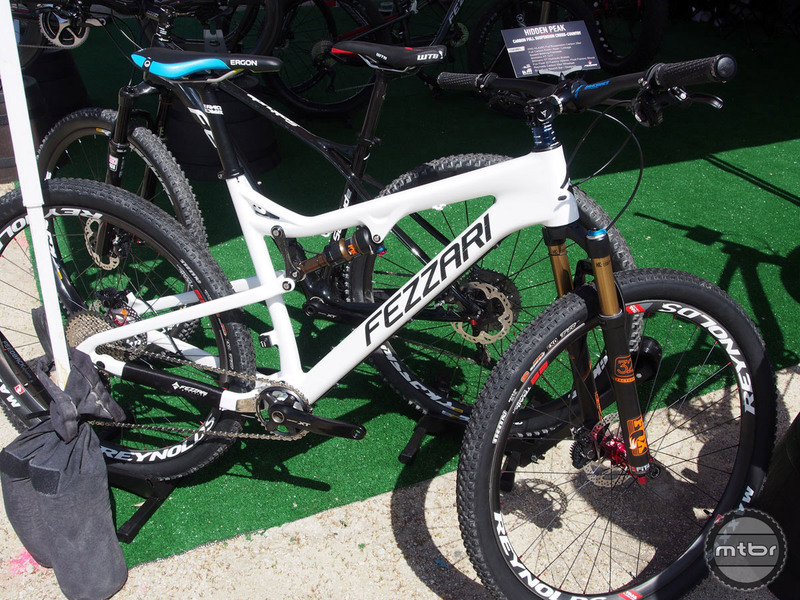 For more info on all these bikes, head over to www.fezzari.com. This Shimano XT build of the new Hidden Peak Carbon XC29 comes with Fox Factory 32 fork and shock, and Reynolds carbon wheels. Price is $4999. No shortage of fun to be had aboard this trail taming machine. The latest version of the Timp Peak features updated frame geometry, a lower 13.5” bottom bracket, and a revised rocker link design that’s claimed to eliminate the pivot service interval required by its predecessor. 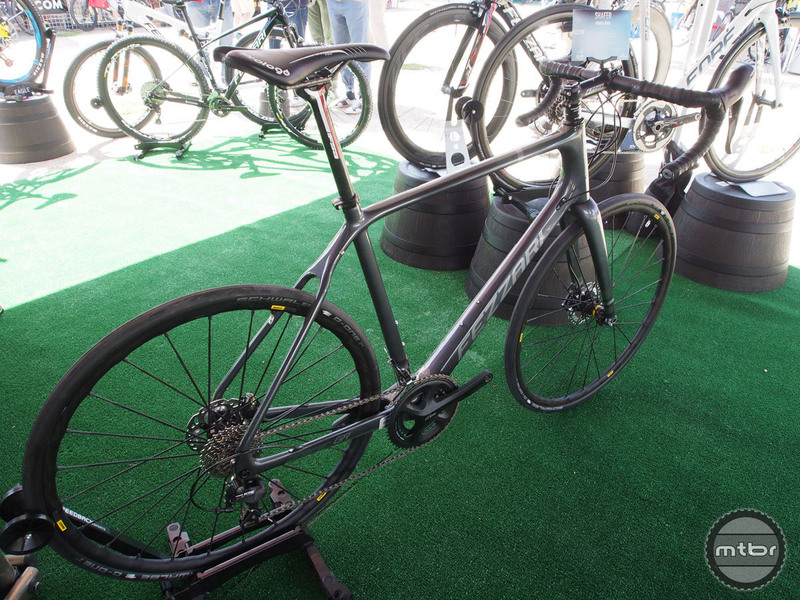 The Timp Peak is also available in an Shimano XTR build with WTB carbon wheels, and KS LEV dropper post for $6199. This eye-catching black/orange frame is one of two color options. 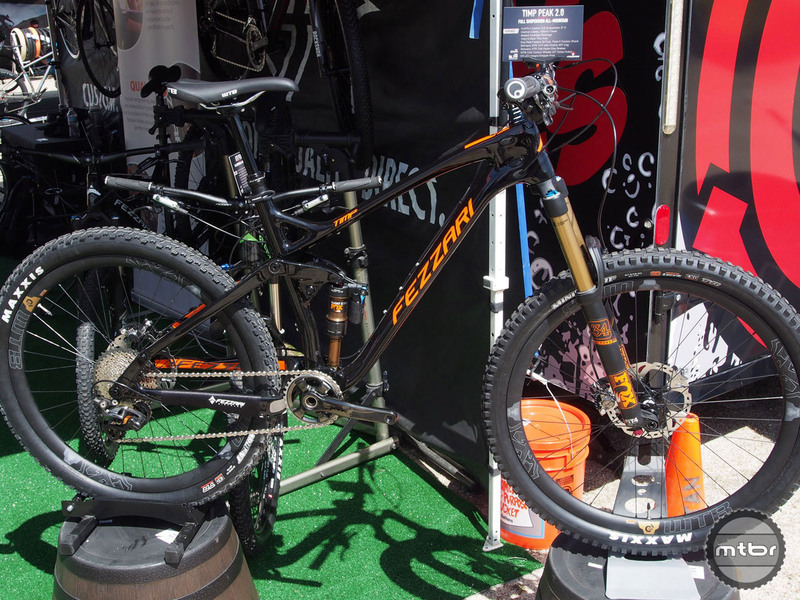 Maxxis Ardent tires are wrapped around Reynolds carbon wheels. 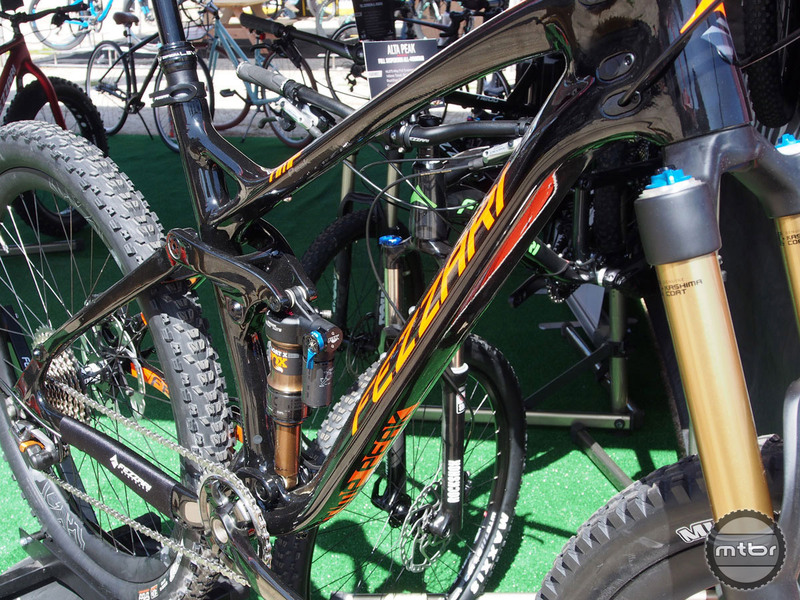 SRAM’s new ultra wide-range Eagle drivetrain is optional spec on this well-appointed 27.5 trail bike. 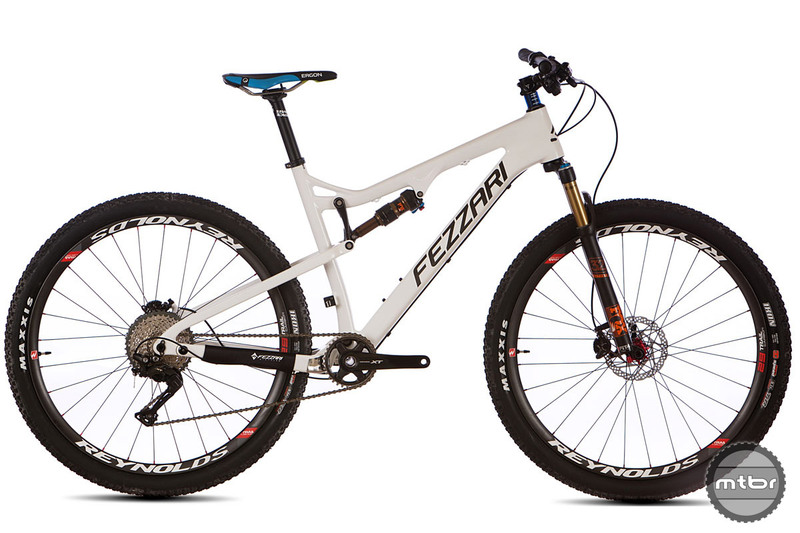 Fezzari’s latest drop bar bike is a disc-brake equipped adventure machine with clearance for up to 40mm tires. I always liked Quark on DS9.